"Any doubt that they breed them thin-skinned on the Gold Coast was well and truly dispelled by the seaside city's local rag on Tuesday. News Limited's Gold Coast Bulletin devoted 465 words - its equivalent of War and Peace - to defending home town honour. At issue, BusinessDay's Saturday feature on the various shonks found on the coast and the parlous state of its tourism and development-driven economy. The Bulletin's sookfest didn't contradict any facts in the piece - the development collapses, the fraudsters, the lifestyles of crooks like conman Peter Foster. Instead, it took aim at the reporter (CBD, coincidentally), who ''travelled here on a junket funded by the ratepayers of the city he went on to attack''. At Fairfax Media, we don't allow commercial considerations to influence our journalism. Do they do things differently on the coast? No, says Bulletin deputy editor Ken Robinson - he says the point was to question whether press junkets represent ''value for money''. CBD also loved the bits where the Bulletin complained about things that weren't actually in the original story, such as calling the place "a pretend city" or "nothing but a Byron Bay with highrises". Well, if that's how you lot think of yourselves, go for it." This article caused the editorial comment in the GCB 2-Apr-2013 which is responded to above. 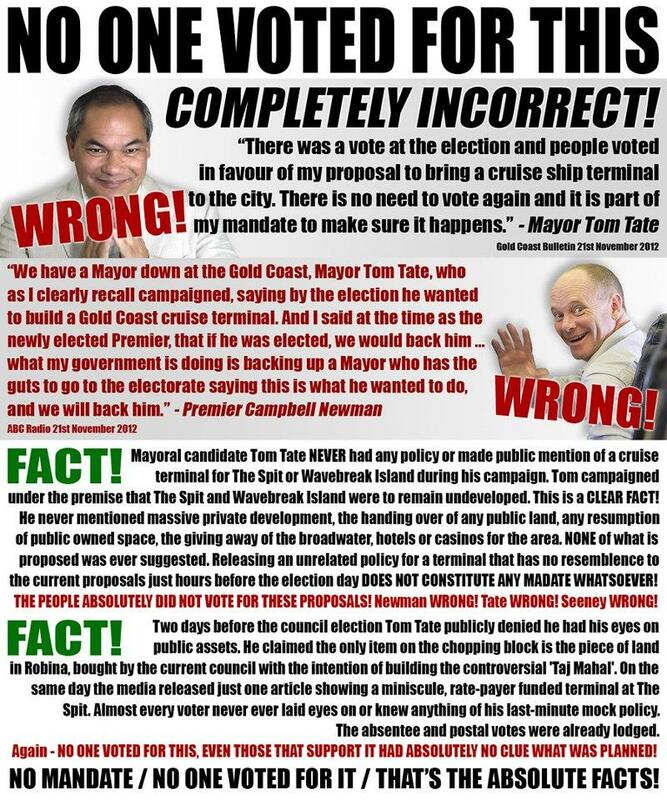 Anyone who as much as comments on the Mayor seems to be attacked by editors of the GCB.This is clearly a compromise and in such contrast to how previous Mayor Ron Clarke was treated. The Pro CST stance against community interests taken by GCB editors seems to extend to any criticism of the Mayor. There are many apparent breaches of News Ltd own editorial guidelines (Professional Conduct Policy) that the community will be following up on. 1.1 Facts must be reported impartially, accurately and with integrity. 1.2 Publications should take reasonable steps to ensure reports are accurate, fair and balanced. 1.3 Clear distinction must be made between fact, conjecture, comment and opinion. 1.4 Try always to tell all sides of the story in any kind of dispute. Every effort must be made to contact all relevant parties. 1.5 Do not knowingly withhold or suppress essential facts. 1.6 Journalists should not rely on only one source. Be careful not to recycle an error from one reference source to another. 1.7 Direct quotations should not be altered except to delete offensive language, protect against defamation, or to make minor changes for clarity. 1.9 Reports of new drugs or medical treatments must be considered with great caution. It is easy to raise false hopes or alarm among readers. 1.10 Information sourced from social media must be verified and checked for accuracy before publication on any platform. 1.11 Editors must be informed of photographs sourced from social media sites. 1.12 Images prepared for publication must meet the guidelines of the Photographic Enhancement and Manipulation policy, outlined below in Section 18.